One of the reasons people turn to boxing workouts to stay fit or to get in shape is because it can be a more interesting, stress-relieving exercise than a typical gym session, such as running on a treadmill or lifting weights. 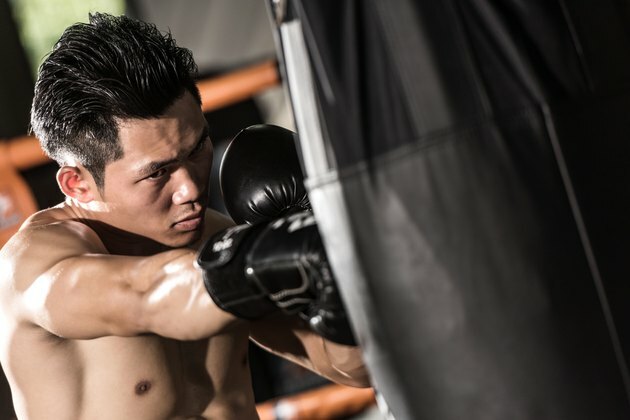 A home boxing gym can also help you find your own motivation to train yourself, rather than relying on getting to a class or using a personal trainer. A boxing gym can be as simple or as complicated as you like, depending on your available space, funds, as well as your requirements. Clear out a space for your boxing gym. You don't need much space if you keep things minimal, but the more space the better if you are looking to move around or spar. Boxing training can make a lot of noise, so a garage or a shed away from the house is preferable. Start with the basics. Consider the flooring: concrete floors can be unforgiving on your joints, so if you plan on skipping or doing footwork drills you should think about laying down mats. Foam jigsaw mats that slot together neatly are a quick and cheap solution. Install a punch bag. Bag training is an important part of boxing training, especially if you will be training at home, mostly without a partner or a coach. You can buy freestanding bags that are easy to install but less durable, or wall- or ceiling-mounted hanging bags that require a fixing bracket and chains. Add any other kinds of bag that you have space for and that you can afford. While a punch bag offers many training options, other bags such as the floor-to-ceiling ball, hook and uppercut bags, or speed bags give you other options that can add variety to your training. Most will not require much additional space or cost and require little effort to fit, with simple floor- or wall-mounted brackets. Add other boxing gear. You will need boxing gloves and wraps, or bag mitts to protect your hands as you hit the bags. If you have a training partner, hand mitts can add another dimension to your training, or you can spar or do drills if you have enough space. Add weights if you want to incorporate strength training into your regime. Kettlebells or dumbbells and barbells are relatively cheap and be kept with the rest of your equipment. Benches or squat racks, and other home gym equipment are also available, depending on available space and your budget. Can I Use a Punching Bag Outside?